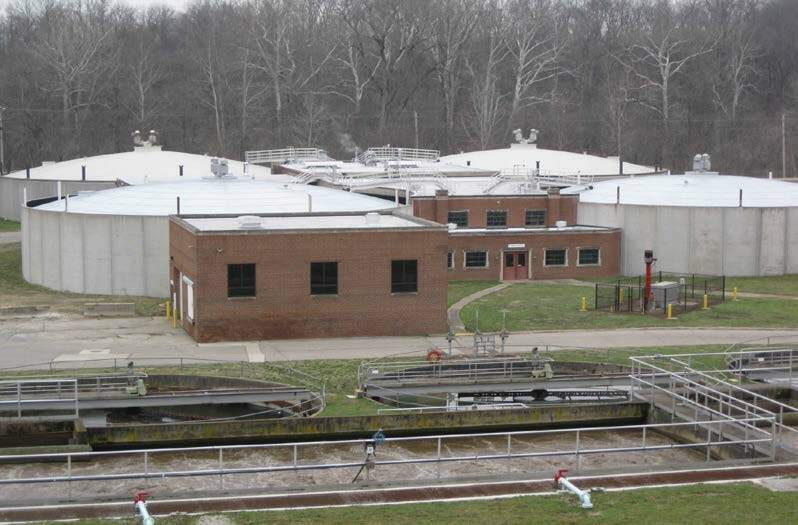 The Richmond Sanitary District welcomes you to its wastewater treatment facility. 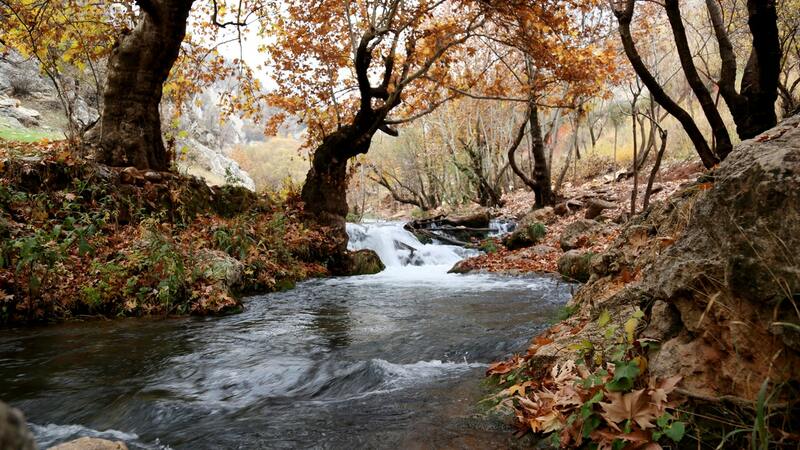 The Clean Water Act of 1972 and subsequent federal and state regulations have mandated all communities to protect our environment by discharging treated wastewater into our rivers and streams that meets the highest standards of water quality. In the face of the present requirements of environmental protection, the Richmond Sanitary District continues to operate its facility with the continuing commitment to its mission to abate pollution and ultimately safeguard public health through its services of reclamation, recycling and disposal of the community’s waste in accordance with applicable statutes. 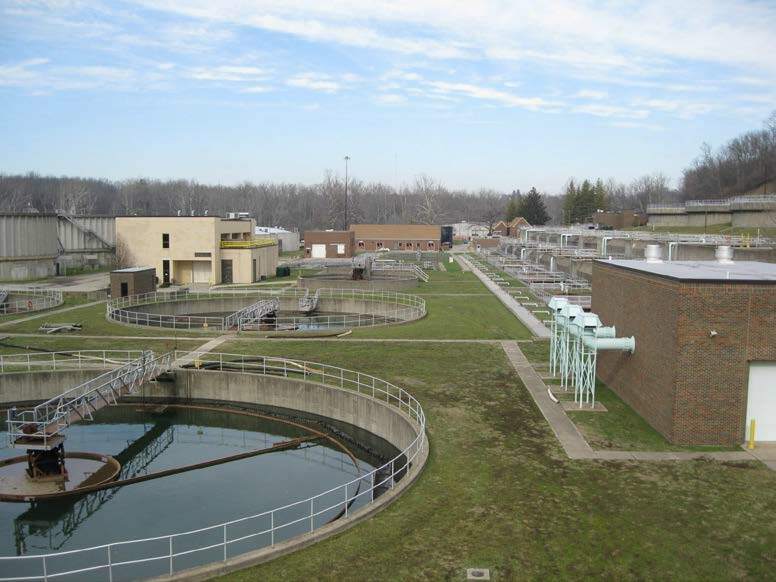 The Sanitary District covers approximately twenty plus square miles within the City of Richmond and Wayne County, Indiana. Operations consist of five operators, an Operations Inspector, and a Superintendent. 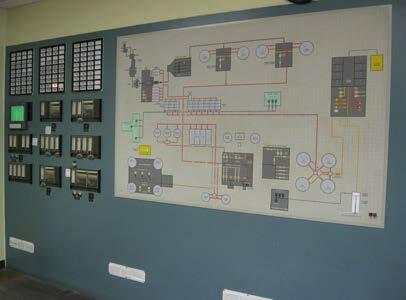 The operation and control of the many steps in the wastewater treatment process are monitored and controlled from the Supervisory Control And Data Acquisition (SCADA) computer system located in the Intermediate Pump Building. The treatment facility is staffed by five operators and one manager eight hours per day, 365 days per year. 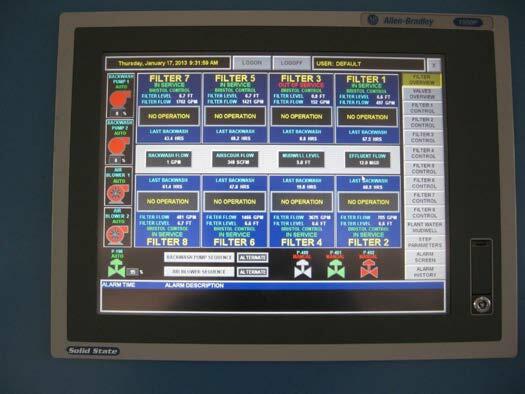 The plant’s SCADA computer system monitors the plant 24/7/365, and provides alarm callouts to notify on-call operators and manager to return to the plant when necessary. The laboratory is staffed 365 days per year. Laboratory employees include three laboratory technicians and two pretreatment personnel. Samples are tested from the various stages of treatment to monitor the effectiveness of each step in the treatment process. Pretreatment personnel monitor, sample and test many industries in Richmond in accordance with the pretreatment program regulations. All wastewater, laboratory, and pretreatment personnel are certified by State of Indiana Department of Environmental Management. 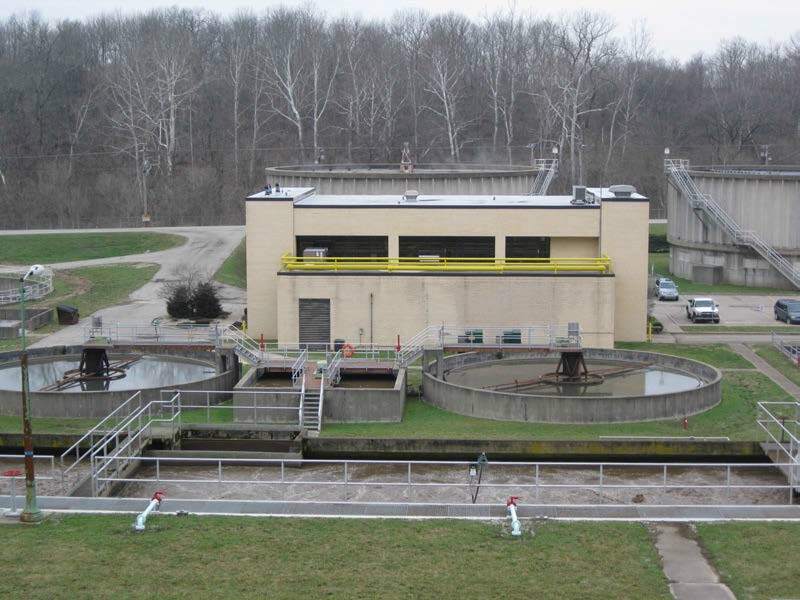 Typically, the treatment plant receives approximately 10 MGD of untreated wastewater through three main interceptors into the headwork’s facility. The influent is composed of approximately 20 percent industrial and 80 percent residential waste. 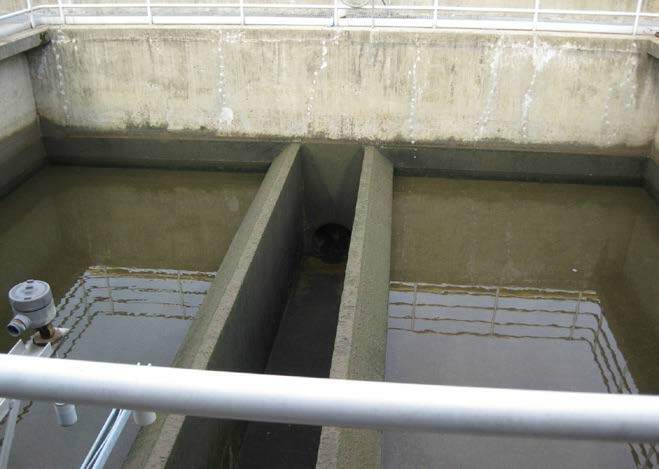 Wastewater influent flows through two step screens to remove objects that could plug or harm the pipes, pumps, and the efficiency of treatment downstream. The screenings are compacted and washed prior to being dumped into carts, which are transported to the landfill for disposal. The screened effluent wastewater enters two “pista grit” removal tank systems. The circular design and direction of the paddles pushes the heavier grit to the bottom of the tanks and floats the lighter organic material out of the tanks to the primary wet well. Two grit pumps transfer the accumulated grit from the grit tanks to a centrifugal washer and dewatering system prior to final disposal at the landfill via the screening trash carts. 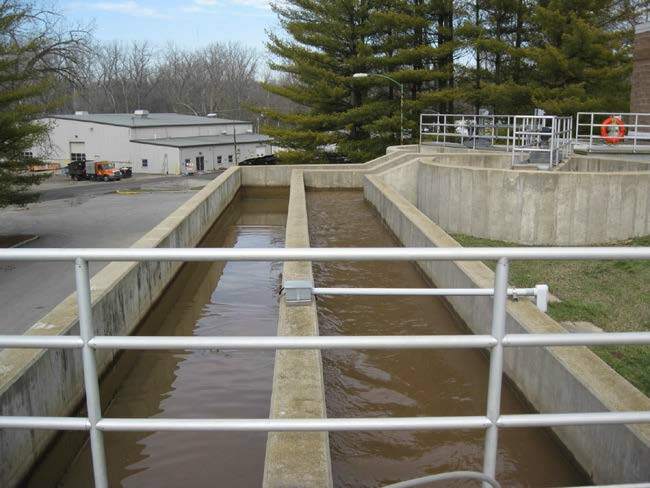 The wastewater flow is measured through one or both of the 3’ parshall flumes. 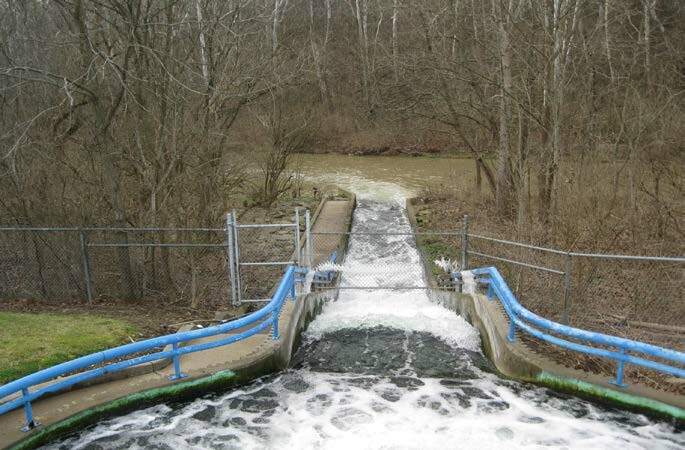 Changes in influent flow rates affect the hydraulics of all treatment processes, such as detention time, surface loading, and weir overflow rate, all of which will affect the efficiency of treatment. The wastewater suspension is gravity fed into the seven rectangular primary clarifiers and pumped into the four circular primary clarifiers. Here, mostly organic solids settle into hoppers in the bottom of the clarifiers for periodic pumping to the mix tank/thickener system before being pumped to the digesters. 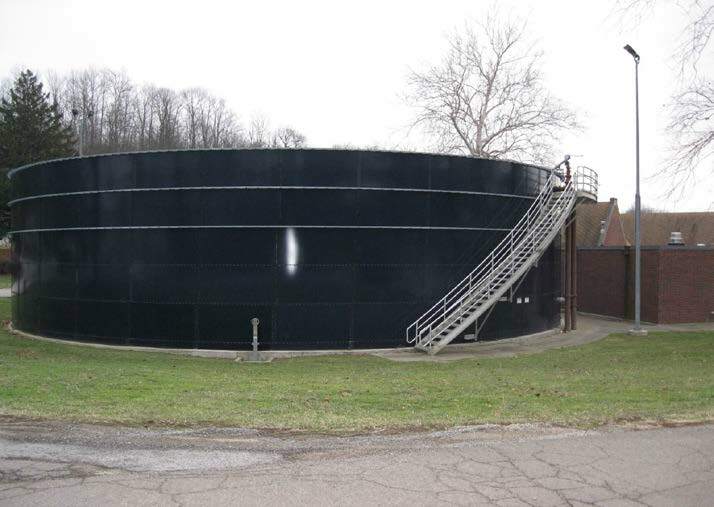 Floating solids that are removed from tanks during the treatment process by gravity or pumping are directed to the scum equalization tank for processing. A newly constructed scum and grease building house two grease reactors and a scum dewatering system called a “rotomat scum drum”. Hot water and scrapers clean the drum slots and surface area during the dewatering process. 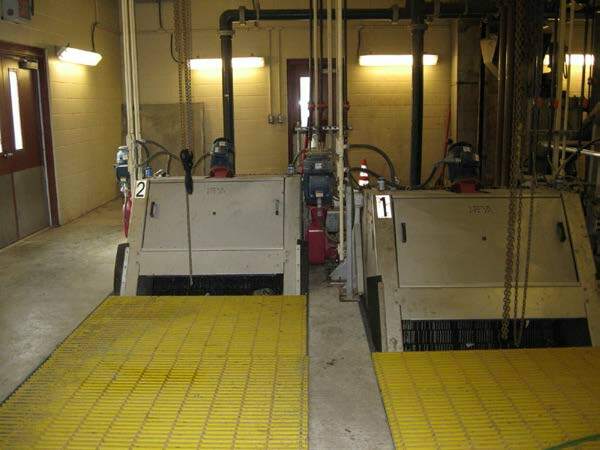 The dewatered scum is compacted and dropped by auger into carts and disposed in the landfill. Grease from restaurants is hauled to our facility for processing from Indiana and surrounding states. Grease that enters the sewer system pipes creates many problems for the collection and wastewater treatment facility. Two rectangular-shaped tanks receive grease for processing. Air is supplied to these tanks for mixing and air requirements for aerobic digestion process. The grease is periodically pumped back to the headworks for treatment. Wastewater treatment is the establishment of a favorable environment which does nature’s work in a time frame controlled by people; this is a natural biological process. The roughing towers play an important role in the treatment of wastewater. A portion of the suspension from the circular primaries flows by gravity to one of the two 90’ x 30’ roughing towers. Aerobic bacteria are grown on the plastic media cells installed in the towers. The rotating distributor arms spread the wastewater evenly across the top of the media. As the water trickles downward, crossing million of square feet of media surface, these microorganisms eat the carbon compounds and reduce the compounds from a 4:1 ratio to a 1:1 ratio compared to nitrogen compounds. When the wastewater is returned to the aeration tanks, this reduced available carbon drives the microorganisms to use ammonia-based materials as their source of growth energy. This helps the treatment process meet the standards for ammonia discharge in the final effluent. The effluent from the roughing towers flow to the seven intermediate clarifiers, three circular intermediate tanks and four rectangular intermediate tanks. They provide a zone of settling to remove any biomass and old bacteria that is continuously being flushed from the roughing towers. The aeration banks are the heart of the wastewater treatment. There are 27 tanks arranged in 9 banks of 3. The aerobic microorganisms require air in order to sustain life and are supplied by three large electric blowers. 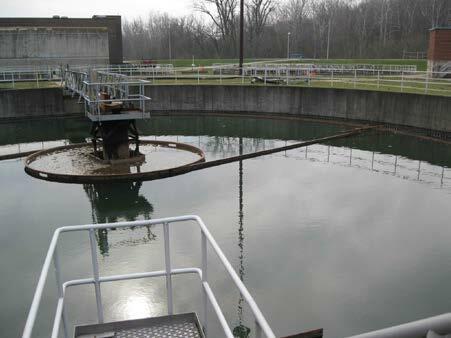 The mixing also keeps the bacteria in contact with the tank’s wastewater contents. The supplied air creates an environment to accelerate the growth of the organism, thus increasing their need for food. Many varieties of aerobic microorganisms digest the organic material; both dissolved and suspended material, reducing the biochemical oxygen demand and ammonia removal. The wastewater from the roughing towers contains reduced available carbon and drives the microorganisms to use ammonia-based materials as their source of growth energy. 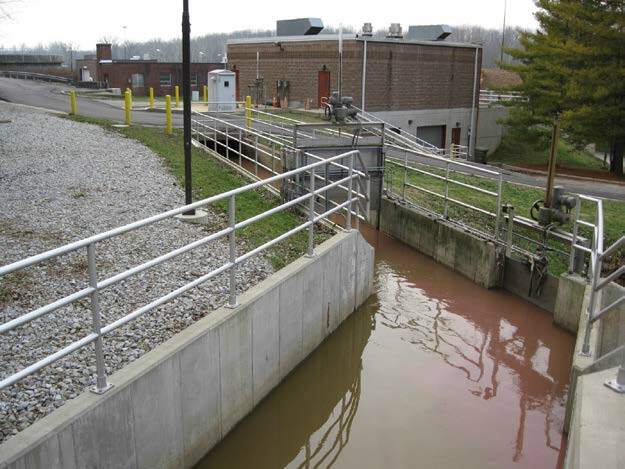 This conventional activated sludge process helps the treatment process meet the standards for ammonia discharge in the final effluent. Alum, a coagulant, is added to the aeration effluent, which promotes in the sticking of particles. This effluent is now made up of bacteria and sludge webbed together to form a floc that settles, and within these floc masses phosphorus is contained. This aids in our phosphorus removal requirements. This aeration effluent flows to four final clarifiers and is the last stage in the separation process. The final clarifiers use gravity to separate the floc from the treated water. 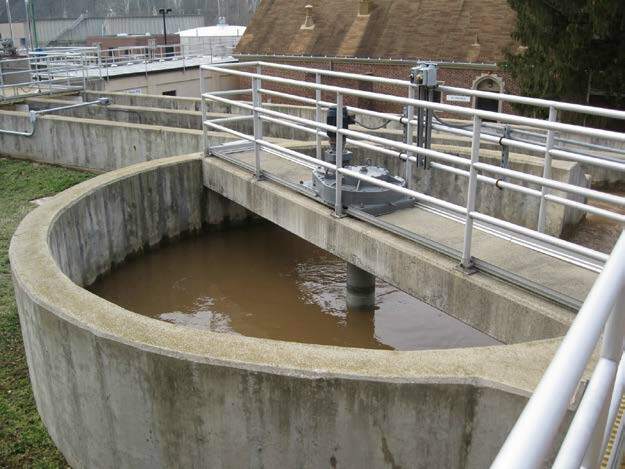 A balance of Food to Microorganism (F:M) ratio is required for successful treatment and a portion this activated sludge floc is recirculated back into the aeration tank system, and the other portion is wasted to the gravity thickeners. Effluent from the four final clarifiers is pumped to the eight tertiary filter cells. These cells contain approximately four feet of mono-media gravel. The water enters the trough in the middle of the cell walls, and water flows by gravity through the gravel media, filtering out the remaining particles in the wastewater. When the gravel media is dirty, the tank is taken out of service and backwashed. Cell backwashing includes water and air scouring. The dirty backwash effluent is pumped to the mix tank/thickener system. 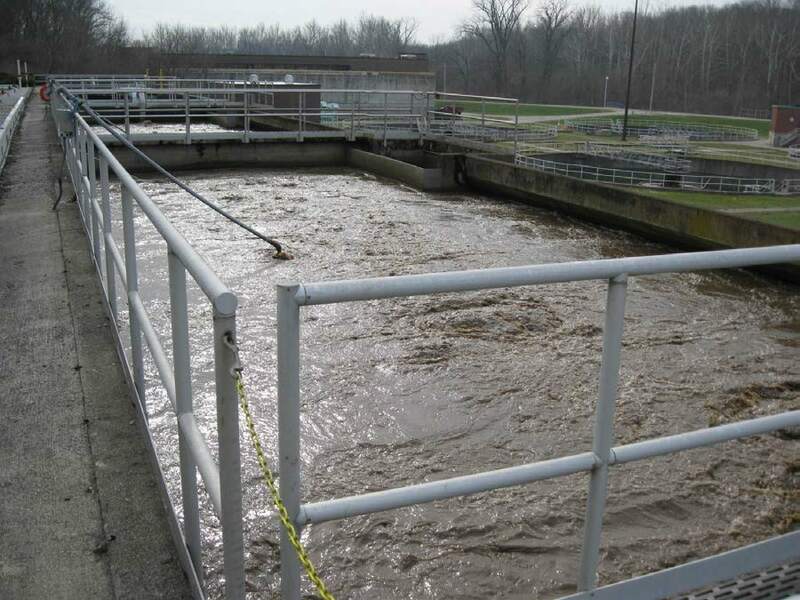 The Richmond Sanitary District’s Wastewater Treatment Facility discharges into the East Fork Whitewater River. The river flows directly into the Brookville Reservoir, an important area recreational lake. 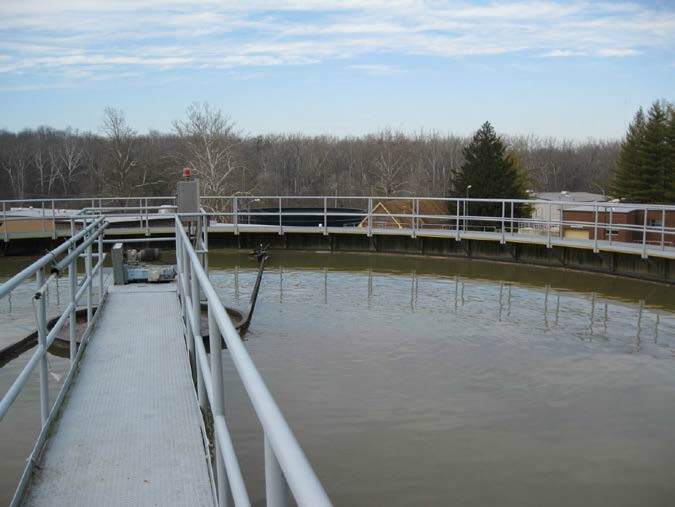 During disinfection season (April 1- October 31) the treatment plant utilizes chlorine gas injection for disinfection and sulfur dioxide gas injections for dechlorination. 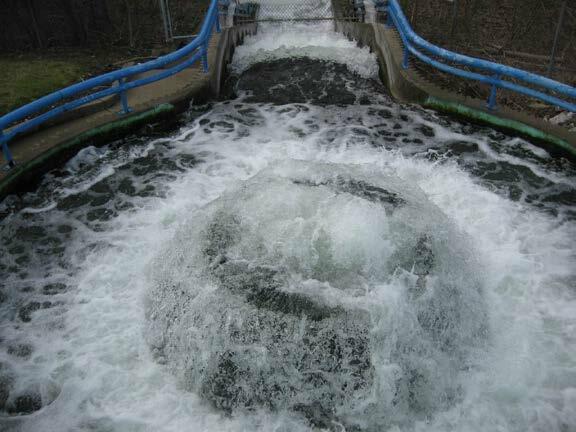 One or more of three effluent pumps transfers dechlorinated effluent to the receiving stream via a cascade aerator. The cascade aerator is a bowl-shaped structure with cascading steps which causes the water to capture oxygen before it blends with the river. 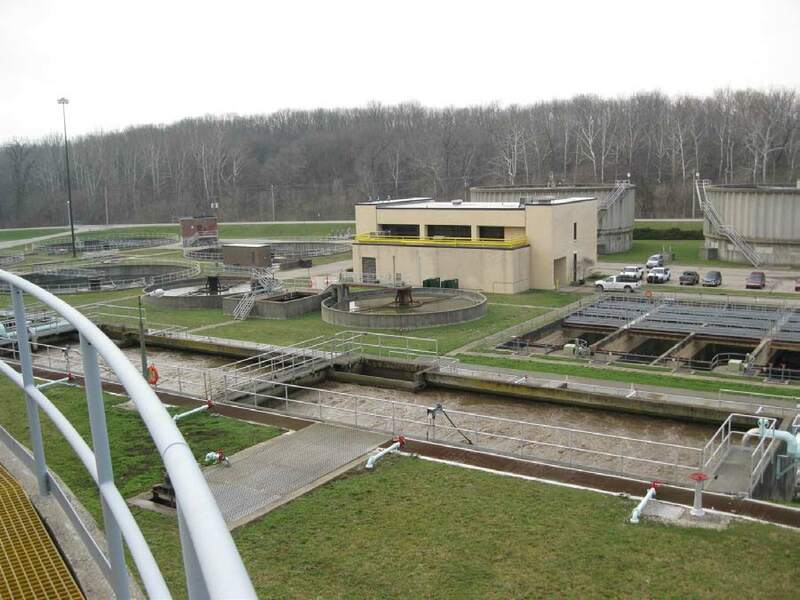 The Richmond Sanitary District monitors the effluent not only for its impact on future human consumption, but also for the impact on the environment itself. One of the projects designed to assist wildlife is visible when entering the Richmond facility. 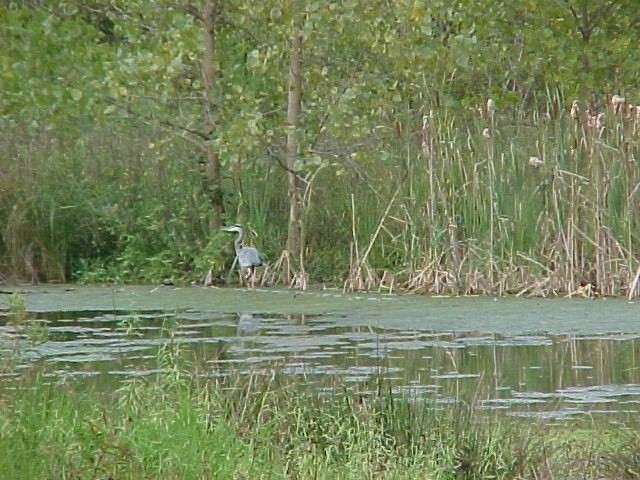 Near the Whitewater River, a wetland was constructed during a mitigation project in the Spring of 1997. 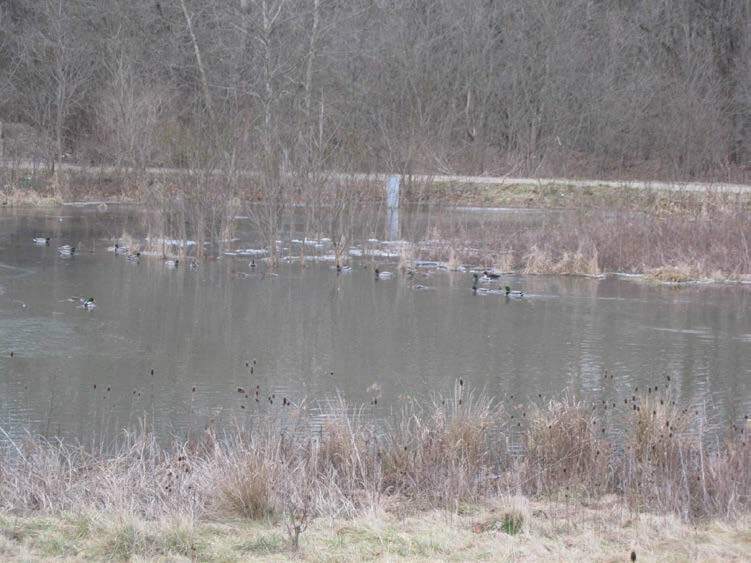 This new wetland is about 1.6 acres in size and is fed by water discharged from the wastewater treatment plant cascade bowl. It has an average depth of 18 inches, with some deeper spots of three feet. A variety of birds, insects, deer, fox, and other animals have been spotted, muskrats have built small lodges in several locations. The mix tank receives the sludge drawn off the primary clarifiers, intermediate clarifiers, mud well debris and waste activated sludge. The mix tank provides a complete mix of sludge prior to entry of two thickener tanks. Dewatered sludge from the two thickeners is pumped to the heated primary digesters and the thickener supernatant is pumped back to the aeration process. During the process of treating wastewater, bacteria digest much of the organic matter as it moves through the system. However, at almost every stage of the process, a certain amount of sludge collects at the bottom of the many tanks in the system. Sludge from the gravity thickeners is first pumped into the two heated primary digesters. Here the sludge is mixed and heated to temperatures 90-100 degrees Fahrenheit. This promotes anaerobic (does not need free oxygen) bacteria to digester the sludge and helps to stabilize it. The bacteria breaks down the sludge particles and some of the by-products are water, methane, hydrogen sulfide, and carbon dioxide. About 95% of the digestion process takes place in the primary digesters. These digesters are mixed to keep the bacteria in contact with the new incoming sludge. Methane produced is used as fuel by the sludge heaters. The primary heated sludge is then pumped to two non-heated secondary digesters. The secondary digesters provide additional anaerobic digestion detention time and water/solids separation. Digester supernatant is pumped back to the primary clarifiers. Secondary digested sludge is maintained until stabilized. The bacteria then die, leaving behind a humus type of fertilizer that is applied to local farmland. Stabilized sludge can be pumped from either secondary digester to an open-top, 1 MG tank storage tank for load out or can be pumped directly into trucks for land application. Stabilized sludge in the form of liquid biosolids is disposed of through the District’s land application program. The LA program consists of nearly 3,000 acres with three counties, providing the District with sufficient land capacity for several decades. 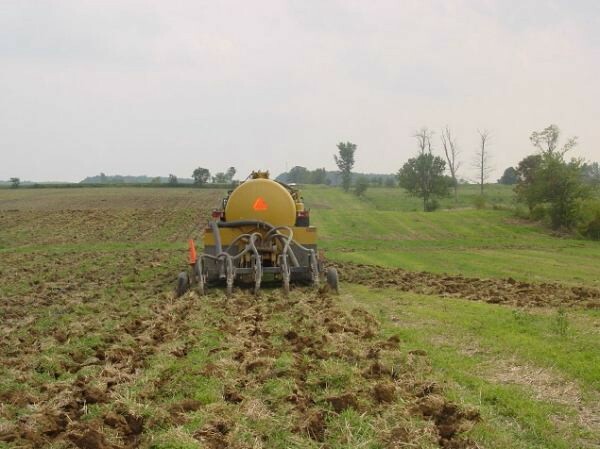 Biosolids contain three major nutrients for crop growth and performance. These nutrients are nitrogen, phosphorus, and potassium. Applied in accordance of our LA program, biosolids help these farmers increase the yield of crops such as corn, oats and soybeans. The humus-like quality of this product makes it an excellent soil conditioner, while renewing the soil it enhances plant growth.